Our first spring quads brought out the masses for this week’s tournament. 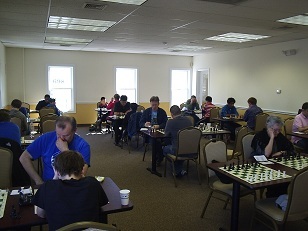 A total of 22 players competed in 5 sections. In quad 1, fourth seed NM Kapil Chandran won all three games to send his rating well over 2300 for the first time! The second section was a swiss with six (!) experts and masters. NM Derek Meredith was perfect from start to finish. Jason Shi finished in clear 2nd place with 2/3. Quad three was the toughest of all. Three players, Gert Hilhorst, Edwin Jin and Michael Morin, tied for first with 2/3. In quad four, another fourth seed, Eric Hilhorst won the section with 2.5/3. Finally, there was another tie for 1st in quad 5 between Carl Scovens and Keshav Rao. Each player scored 2.5/3. Don’t miss out on all of the action next week as our quads continue to grow!